3 Bedroom Semi Detached House For Sale in Surrey for Guide Price £650,000. A Brand new 3 bedroom semi detached executive home offering spacious accommodation of 1927 sq ft arranged over four floors and situated in a quiet cul-de-sac location close to Caterham town centre. 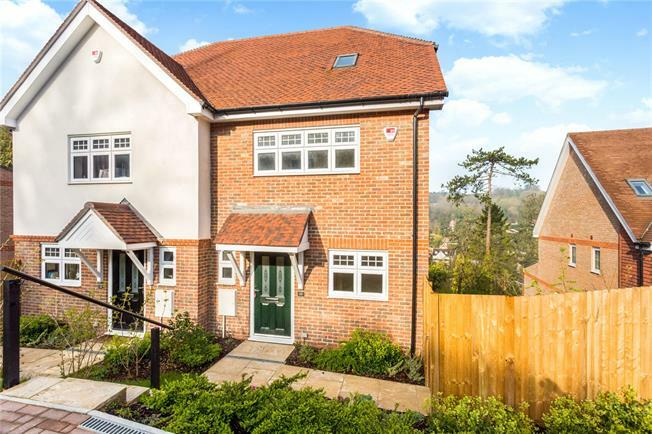 The property forms part of an exclusive development by Messrs Village Developments and are built to a high specification and offer modern living in a beautiful leafy setting with views over the valley. The Lower ground floor comprises a modern kitchen with stylish two tone units and Quartz worktops and intergrated appliances, 5 ring gas hob with extractor above. The kitchen is open plan to the Dining area which has direct access to the garden via bi-folding doors. The ground floor has an impressive living room with juliet balcony, family room, a seperate study, WC and cloaks cupboard. The first floor has a guest suite with ensuite shower room and full width fitted wardrobes, family bathroom and third bedroom. On the top floor there is the master bedroom suite with spacious ensuite shower room and fitted wardrobes. Tucked away within a quiet cul-de-sac, Caterham town centre is just 0.6 miles and has extensive shopping facilities including including a Morrisons and Waitrose supermarket. The station has direct services to London Bridge and Victoria in about 45 minutes. The M25 is approximately 2 miles distant offering easy access to Gatwick Airport and the motorway network. The property is approached over a block paved driveway providing parking for two cars. The rear garden is laid to lawn and enjoys views over the valley. Please be advised that the property has been virtually staged for marketing purposes. Carpets are by seperate negotiation.